Caribbean Coast – It gets quiet this month as the winter storms in the Atlantic abate, leaving glassy waves, mostly waist high or less. This leaves great conditions for longboarding, stand up paddling, snorkeling, and scuba diving. Pacific Coast – The South Pacific has already lit up Costa Rica with waves well overhead and this is expected to continue throughout May. Expect overhead surf at least 20 out of 30 days in the month. Smaller waves can still be found in sheltered spots, either with offshore islands or those beaches that face northward. Get ALL the tide charts for 2014 on CRsurf.com! Upcoming Specialty Camps – email us to sign up and receive $100 off per group! 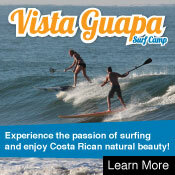 In our last newsletter we listed specialty surf camps offered by La Ponderosa in Playa Pavones, Real Surf Trips in Playa Negra, Vista Guapa in Playa Jaco, Safari Surf School in Playa Nosara, and ISLS in Playa Tamarindo. These camps offer top notch service and get you to the breaks that match your level of experience so you maximize your water time. If you want to improve your surfing, learn Spanish, or participate in a volunteer program to help the local surf community then just send us a note and we’ll make your dream a reality. Best flights: This month Spirit Air still has flights from Orlando to San Jose for $276 roundtrip (+$30 each for checked bags, +$35 each way for carry on, surfboards are $100 for two boards in one bag). JetBlue has prices for $394 for similar dates, but they are non-stop and you get one checked bag free. In June and July, prices start going up since school is out, so get your tickets NOW. CRsurf team rider Noe Mar McGonagle recently won a Volcom Grom Series contest in Playa Hermosa, earning him a ticket to Newport Beach to compete in the world finals. Also, his sister Leilani took TWO medals in the ISA World Junior Surfing Games in Ecuador, helping the Costa Rica team finish in 11th place out of 32 countries. The first Camelo Bikinis Surf Festival was held behind the Backyard Bar on April 19th. The all women’s event had Jaco local Lisbeth Vindas winning the Women’s pro division while Megwyn Saunders took 1st in the pro Bodyboarding division. 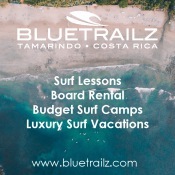 Book a vehicle rental through us for a week or more in Costa Rica before the end of 2014 and CRsurf will donate $25 to Community Carbon Trees, a non-profit group that empowers women by teaching them about the environment and planting native species of trees for reforesting projects in Costa Rica. The donation pays for planting a tree and maintaining through its growth cycle. So far we have raised hundreds of dollars for the group and our goal is $1000 for the year.